Discount Magic - Glass Card Deck (Crystal Deck). An Ambitious card type of effect with an offbeat climax. A spectator takes a card from a deck and signs it. 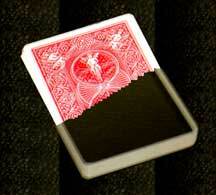 The performer pushes the signed card into the middle of the deck. The card magically jumps to the top of the deck. This is repeated again and again and finally for a climax the entire deck transforms into a solid block of clear plastic. Glass Card Deck (Crystal Deck) An Ambitious card type of effect with an offbeat climax. A spectator takes a card from a deck and signs it. The performer pushes the signed card into the middle of the deck. The card magically jumps to the top of the deck. This is repeated again and again and finally for a climax the entire deck transforms into a solid block of clear plastic.